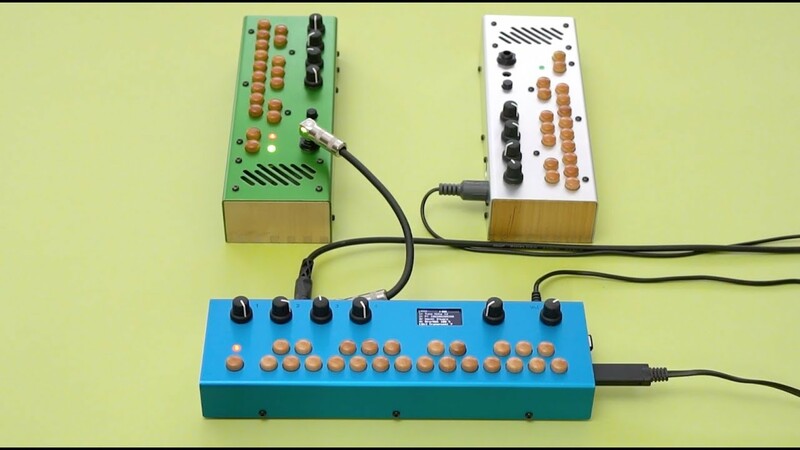 Randomlog is a cousin of the Organelle’s Analog Style. In this patch, the values for Cutoff, Resonance, Attack, and Release are chosen at random with each note! Randomlog is a synth with unique control of Cutoff, Resonance, Attack, and Release: Each note pipes a different random value to these parameters! Set the range of each parameter and let the patch do the rest. Use the built-in sequencer or latch function to play some notes while you vary the probability of each control. 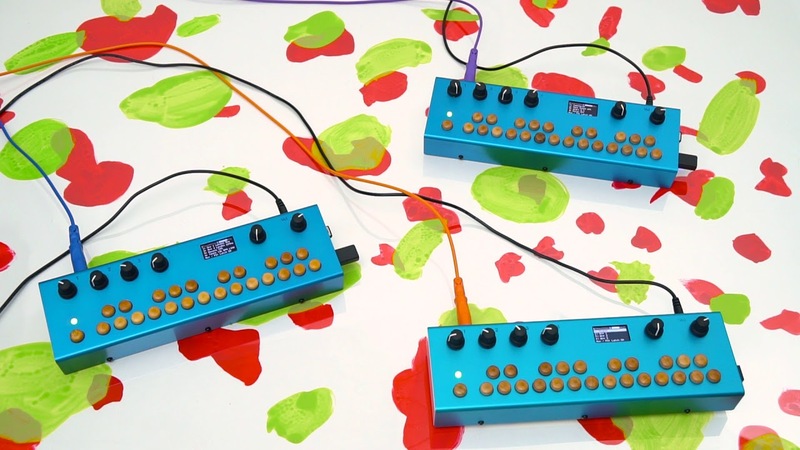 Send the two oscillators in and out of tune with each other for extra weirdness. Select one of nine synth voices and then dial up settings on two independent arpeggiators. Add unpredictability (interesting-ness?) with note probability control! 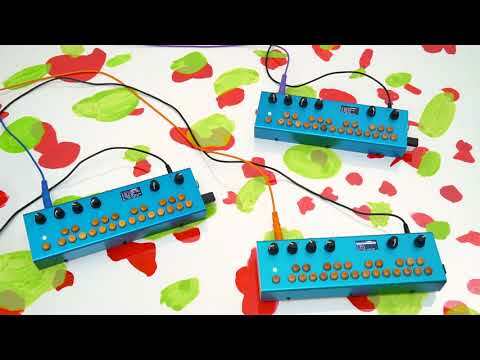 Two independent arpeggiators feed notes into a multi-synth. 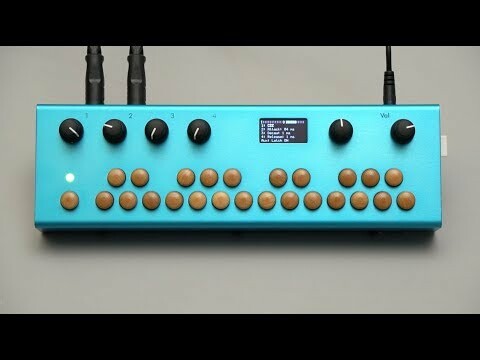 Choose a voice from the multi-synth and let the ocean of arpeggiated notes lap onto your beach and/or capsize your boat! Page 1: Global - Set arpeggiated note length, reverb, and tempo. Page 2: Synth - Knob1 sets the synth voice. The synth voice will determine what the other three knobs control. The 'Transposition' control doesn't make sound, but does transpose your pressed/latched notes! Pages 3 & 4 - Arpeggiator settings. Each arp has the following settings: Pattern, Beat Division, Octave Transposition, and Probability. The Probability control is helpful as it adds unpredictability to the arpeggiation. 100% probability means that a note will sound every selected beat division. Probability settings below 100% will mean that a note may not play on a given beat. Link enabled for tempo syncing with other devices on a shared wireless network. To save your settings, use the ‘Save’ or ‘Save New’ command in Storage menu. Special thanks to Chris Powell for his contributions to these patches! 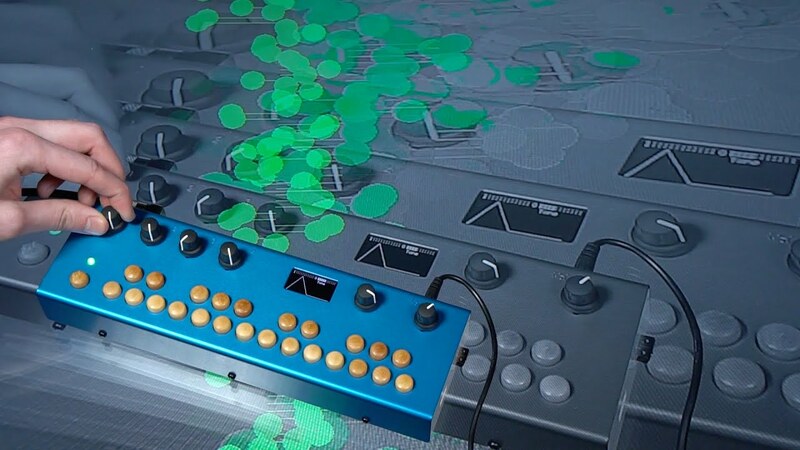 Three independent arpeggiators harness the power of probability and subtractive synthesis. This patch features three arpeggiators. Each arp has the following settings: Pattern, Beat Division, Octave Transposition, and Probability. The Probability control is helpful to add unpredictability to the arpeggiation. Set Attack & Decay time, synth tone, and tempo on the 'Global' controls page. To save your settings, use the 'Save' or 'Save New' command in Storage menu. 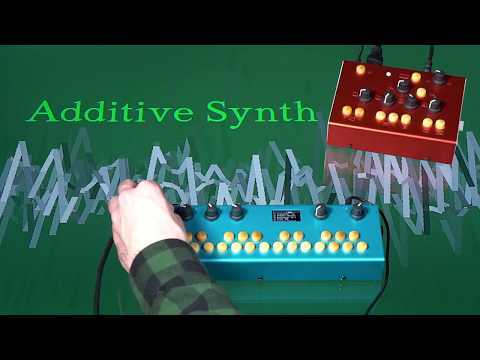 Synthesizer with controls for amplitude, pulse width, and tone envelopes. Includes visual representations of each envelope! CZZ-Multi is a four voice, four page patch. The envelopes for amplitude, pulse width, and tone have their own pages. The envelopes are shown graphically. In each of these three pages, Knob1 sets attack, Knob2: decay, Knob3: sustain, Knob4: release. The fourth page is for setting note transposition, pulse width, filter, and oscillator sync. The Aux button controls the sequencer. This patch includes code from the CZZ synth developed by rjdj. 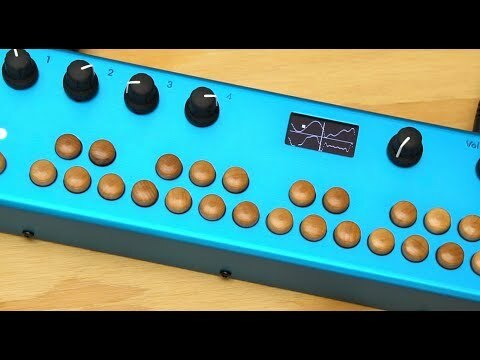 Four-voice additive synthesizer with sequencer. Great for church organ, carousel, dissonant, and 'early synth' timbres. Knob2: Preset Selection. There are 22 presets controlling 12 partials. Transform incoming sounds into a synth voice by selecting and amplifying specific frequencies of the incoming signal. Transpose the voice and mix it with the original. This patch features 9 synths/samplers, 8 sequencers, & 14 effects for 1008 possible sound creating combinations (9x8x14)! 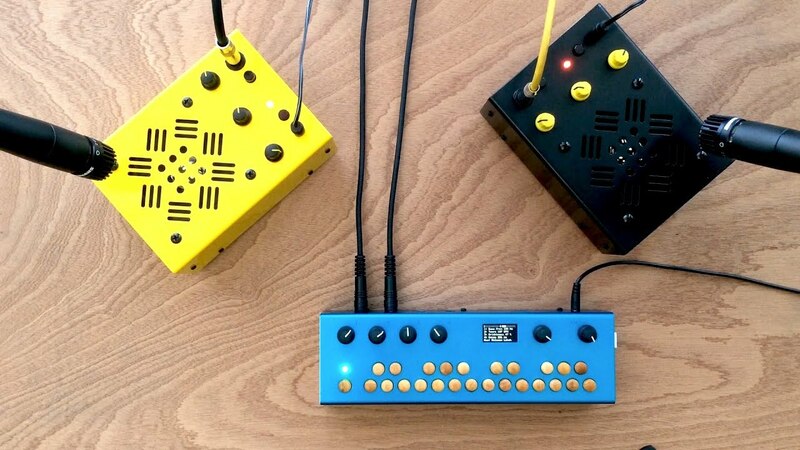 Choose one of each module to build up a sound; then change it on the fly! 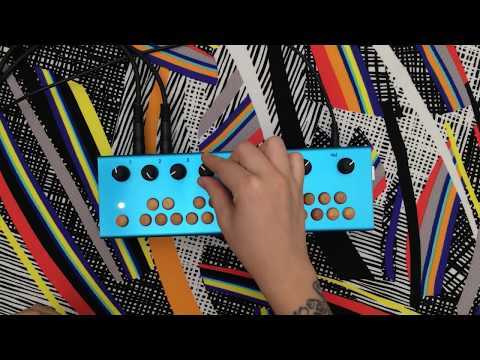 1008 is a kind of modular instrument. There are four pages in this patch, one for each module type: One page for sequencers, one for synths/samplers, one for effects, and a page for transpose and tempo control. Use the first three pages to build up a sound combination. On each of these three pages, Knob1 selects the module. Knob2-4 control parameters determined by the module. 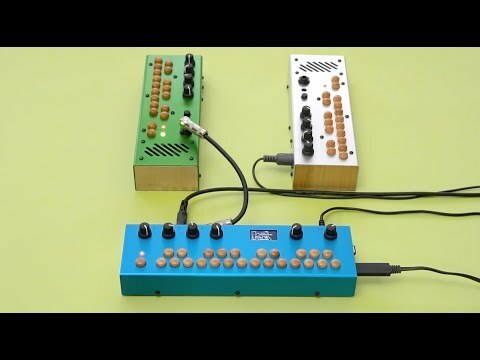 Aux and Foot Switch: Control sequencer or latch depending on sequencer. This is a simple countdown timer patch allowing you to set a time and then start the countdown. Use the first 3 knobs to select hours, minutes and seconds. Press aux to start the countdown. When it reaches 0, the alarm sounds! The fourth knob controls a background tick-tock sound. All the sounds tick tock and alarm clock bells can be replaced with your own less alarming samples. The keyboard also plays a simple synth tone. Bass synth with frequency ramp. Create swoopy or sharp frequency ramp downs. Then run it through built-in effects and sequencer. 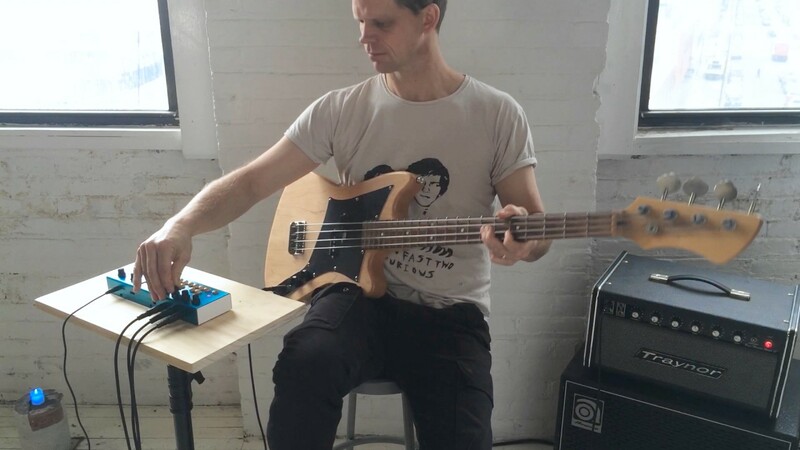 2 page combo patch: control the Rampi Bass synth, and choose an effect. The Aux button controls a sequencer. 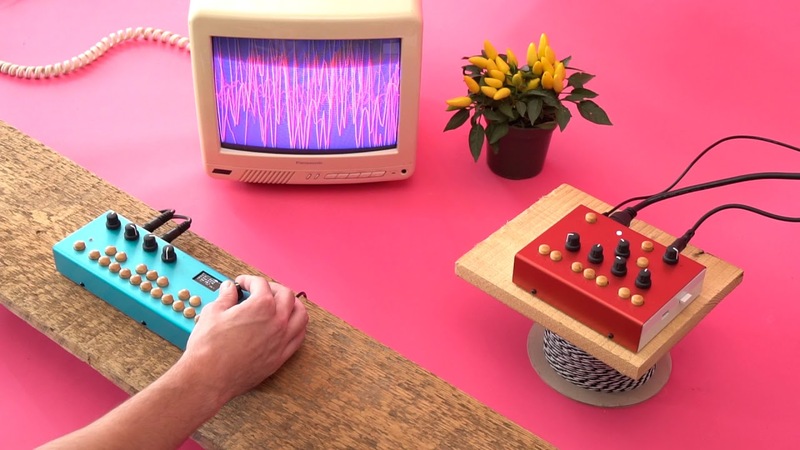 Tune D PB is a multipage synth built around percussive samples. 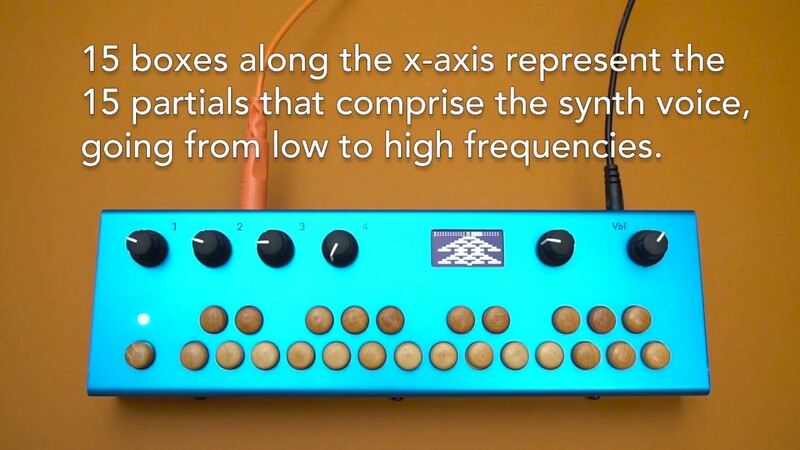 Delay synthesis, effects and a sequencer, all in one patch! This 3-page patch combines Tuned Delay and sequencing from Pow Pow's Polybeats with an array of audio effects. 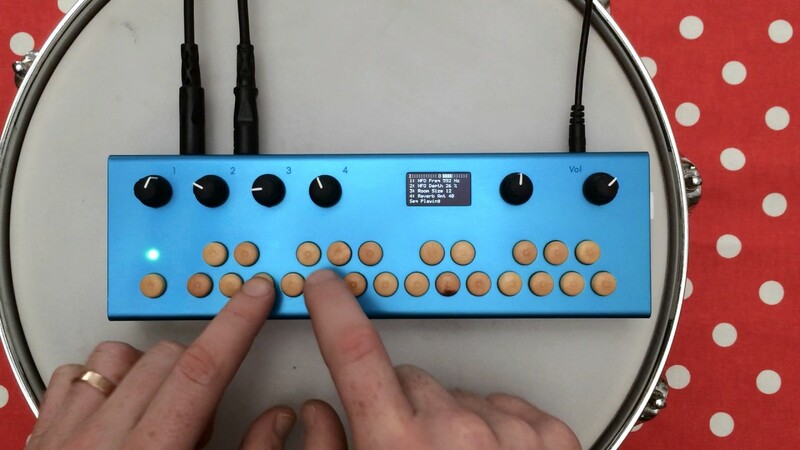 Control a tuned drum feedback synthesizer, choose an effect, and key in a poly beat sequence. Knob parameters are specific to each page. This patch Link enabled for syncing with other devices on a shared wireless network. 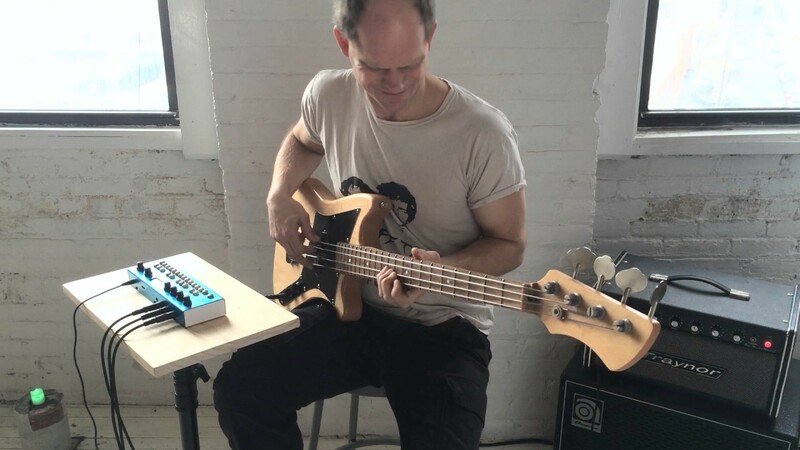 Pitch-tracking arpeggiating synthesizer which is great for guitars, basses, or whatever you want to run through it. As the name implies, this works great with guitar, but also with any pitched sound, like bass or vocals. You can also get interesting results using un-pitched sounds like drums. 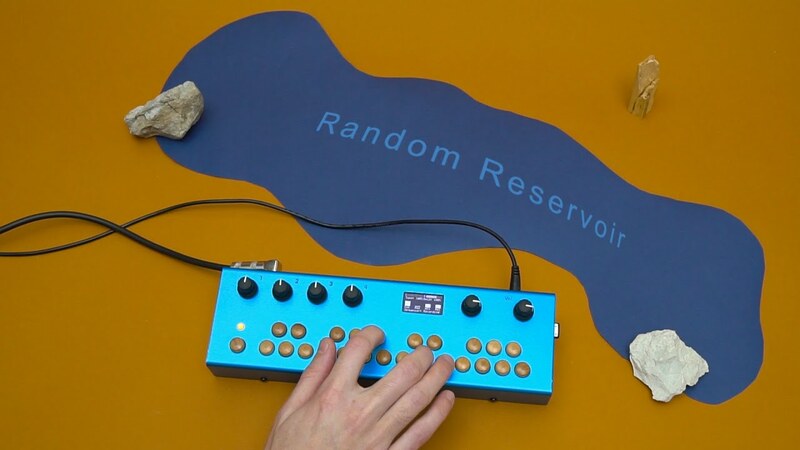 A kind of randomizing arpeggiating synthesizer with circular panning. Hold down some keys and Genny 1 plays the notes in random order and register. Two low frequency oscillators control the timing of the notes. The synthesis is circular panned around and around resulting in clouds of notes. Aux and Foot Switch: Enables a keyboard latch so you can set it and forget it! Make ramping drum sounds, create drum kits, and record sequences! Drummy lets you prepare a sound for each key. Tune up a different drum sound on each key by customizing start frequency, ramp time, noise and decay and then record a sequence. This patch has two states: edit state and play state. Pro Tip: In edit state: Copy parameters from one key to another by pressing and holding a key and then press a second 'destination' key. This is useful for creating many similar sounds. Don't forget to save your work! Exit Edit State and then use the 'Save' or 'Save New' command in Storage menu. Play state: the default state. Keys play the kit. 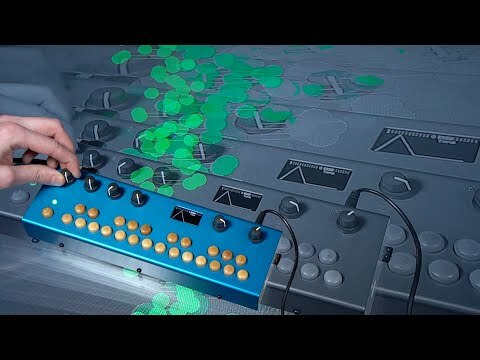 Aux: Sequencer Control. Press and hold to record enable. Punch in a sequence of notes and quickly transpose it! 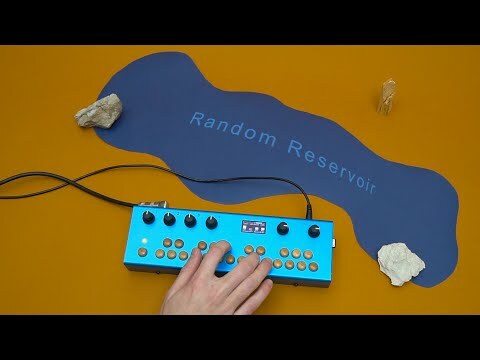 Make weird arpeggios and melodies. Press and hold the Aux button to enter sequence record mode. Then 'punch' in a sequence up to 32 notes in length. While punching the notes in, Knob1 controls the loudness of each note. Press Aux when you are finished. Now the sequence will be transposed to whatever key you press. In Play mode the knobs adjust tempo, pitch, tone and decay. 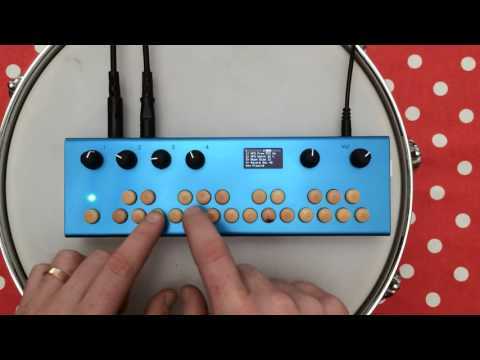 Hit the Aux button to latch your arpeggio and make a looping jam! The currently pressed or latched key will have a double wide circle on the OLED keyboard. Punchy sends and receives MIDI notes too, so you can set arpeggios with low notes with a MIDI keyboard and also send them to another synth! Aux: Quick Press: Latch. Long Press: Enter Punch Mode. 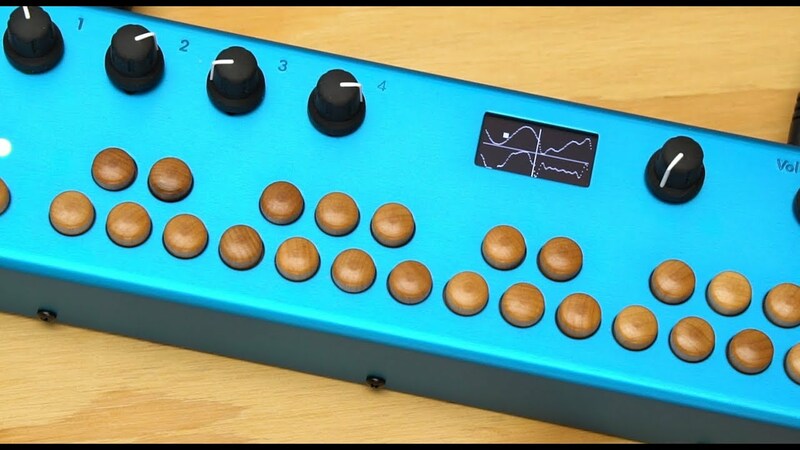 Pitch-tracking monophonic synthesizer. Send audio from guitars, voice, drums, other synths, etc., and the patch will synthesize based on your octave and semitone settings. Send audio into the Organelle on this patch and receive a fresh, monophonic synth tone! Blend between dry and wet signals, change filter cutoff and resonance, and add some glide with the Organelle’s parameter knobs. Use the aux button to jump through different octaves or fifths, and use the keys to transpose by semitone. To save your settings use the 'Save' or 'Save New' command in Storage menu. Assigns a MIDI file to each Organelle key. Press a key to play. Set tempo, tone, modulation, and decay. You know you have some MIDI files you want to load into this! This patch plays MIDI files. In the patch folder are 24 MIDI files: one for each Organelle key. Press a key to begin playback, press again to stop. The MIDI notes are sent out for controlling other gear, and they also play on a simple built-in synthesizer. Included are the 24 preludes and fugues of J.S. Bach's Well-Tempered Clavier. Replace the files with your own! 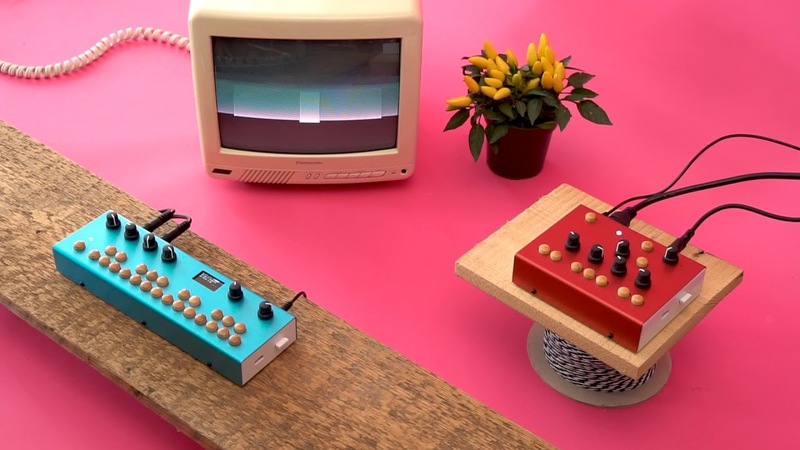 Electric piano emulation using FM synthesis. 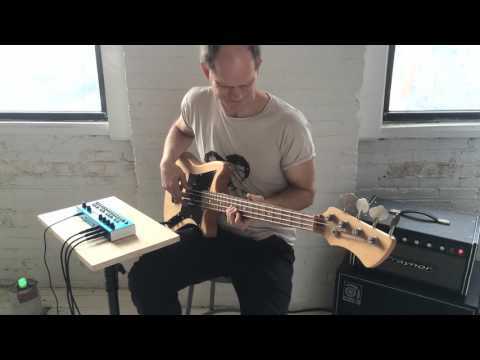 Controls for tone, modulation, transposition and decay. You can turn the modulation up to get tones that sound less like a Rhodes and more like a classic FM synth. Based on the rjdj rhodey patch which itself is based on the STK rhodey code. Chords Roll allows you to play entire chords by pressing one key. You can select from 12 different chord types with Knob2, and then control how fast the chord is 'rolled.' The notes comprising the chords are sent out over MIDI on Channel 2. 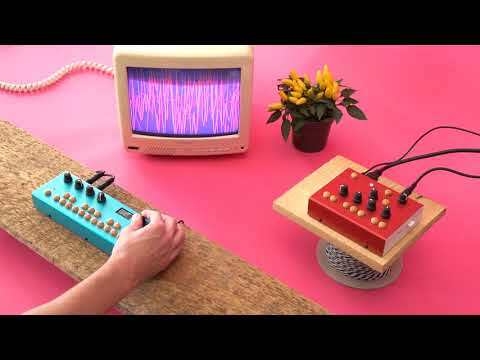 This is a vocoder with reverb and latch; retune incoming sound with the keyboard! Plug in a microphone or another instrument with a 1/4" cable and use the keys to retune the sound. You can control the mix of vocoded sound and unaffected sound and add reverb before the final output. The whole keyboard is tunable and features a latch mode for hands free operation. 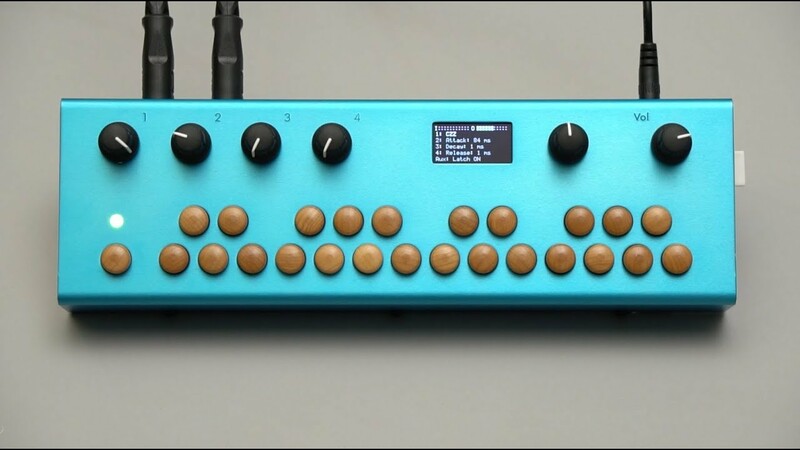 Harmonic drone synthesizer with sequencer. Each key is an overtone on the harmonic series. You can adjust the volume rise and fall time from < 1 second to 60 seconds making it easy to control a slowly evolving tone. 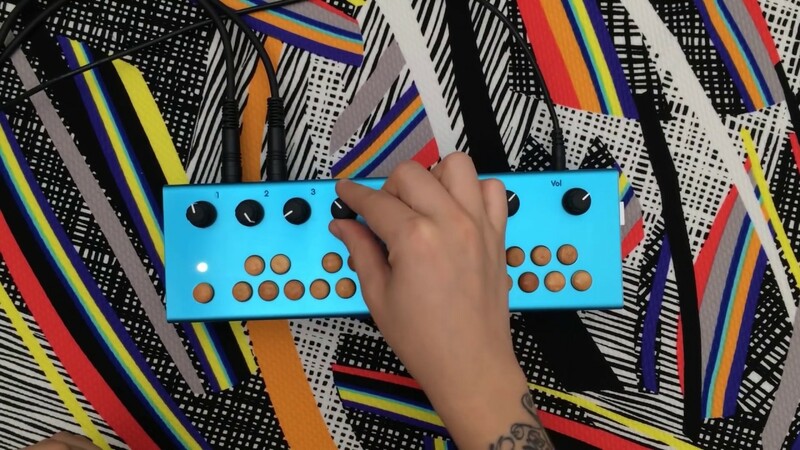 Single key presses become little melodies in this synthesizer as steps chromatically from your most recently played note to the newest one. This synth features a 'stepped' portamento (if that can be a thing) between the penultimate and most recent notes. It will step chromatically at a rate set by the tempo. Select waveform for different timbres. The notes are fed into a delay which complicates things. Aux button controls a sequencer. A simple polyphonic synthesizer that plays back notes in decreasing octaves. Play notes back in decreasing octaves with an adjustable range and rate in one of four voices. 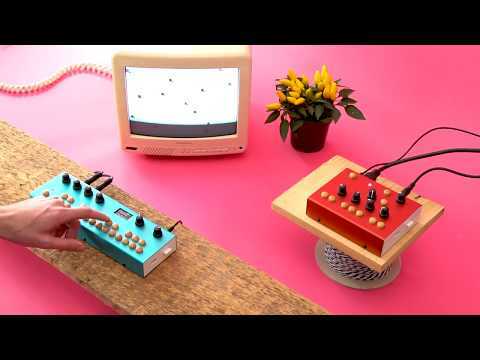 A simple polyphonic synthesizer that plays back notes in increasing octaves. Play notes back in increasing octaves with an adjustable range and rate in one of four voices. Tone synth with frequency drop. Play notes and then hit the aux button to drop the frequency to 0. Aux and Foot Switch: Drop the freq. Polyphonic version of 'Nice Surprises.' 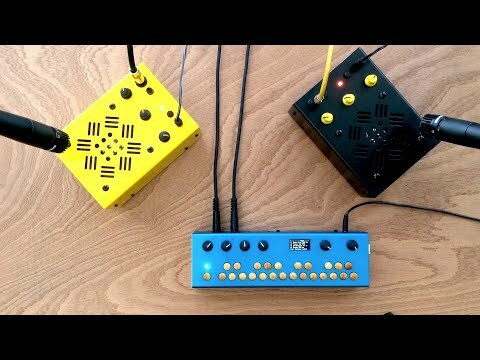 Three square wave oscillators combine to increase levels of (dis)harmony. One oscillator produces 'junk'/random frequencies that adds nice surprises. The same synth as Nice Surprises but with four-voice polyphony. Control three square wave oscillators with this patch. Keyboard controls the base frequency of one oscillator, also tunable with knob 2. The second oscillator plays a selectable harmonic above the base frequency. The third oscillator plays a adjustable amount of random junk frequencies at the beginning of each note. Set the amount of 'Slidiness' as oscillators glide to their next frequency. Aux button controls a sequencer: hold it down to enable recording, begin playing to start a recording, and press Aux again to finish. 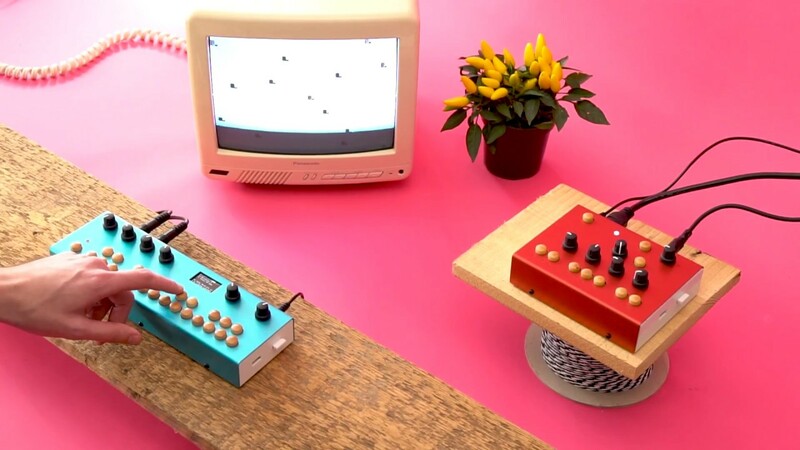 A Link-enabled metronome patch with accent control and keyboard synth for tuning up the band. A basic metronome patch. Start and stop the metronome with the Aux button. Control tempo and select a beat accent (or none). 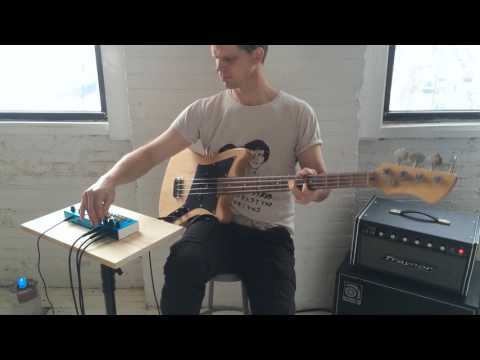 The keyboard plays a super simple synthesizer tone that is useful for tuning up. Polyphonic, sine wave version of 'Nice Surprises.' Three oscillators combine to increase levels of (dis)harmony. One oscillator produces 'junk'/random frequencies that adds nice surprises. This is the same 3 oscillator synthesizer and sequencer as Nice Surprises, but this time using sine waves instead of square. This allows for some cool weird organ tones. It is also 4 voice polyphonic. 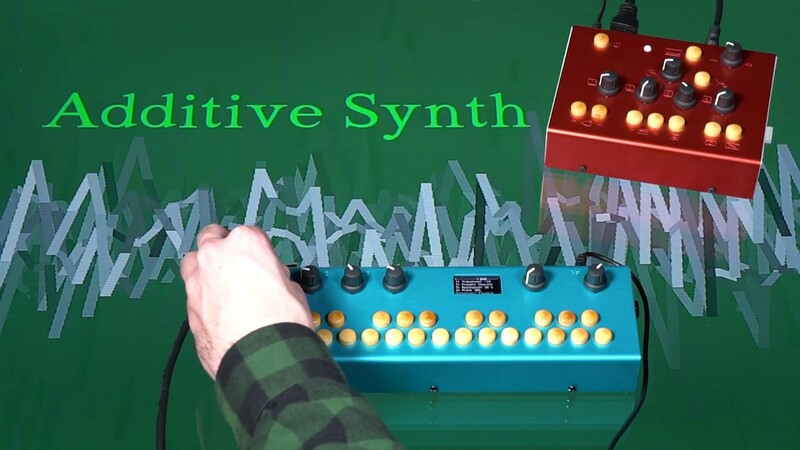 The 'classic sawtooth wave into a resonant filter' synth! Features the usual controls for cutoff, resonance, oscillator tuning. Aux: Sequencer Controls. Hold it down to enable recording, begin playing to start a recording, and press Aux again to finish. Foot Switch: Shifts voice up an octave. 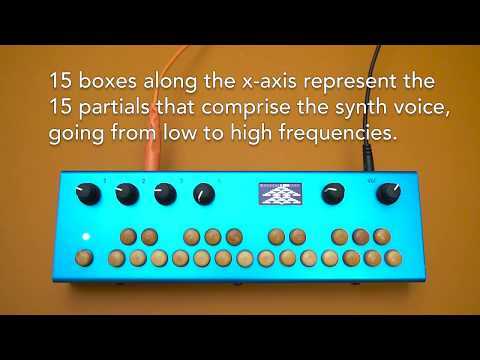 Six-voice arpeggiating synthesizer. MIDI notes are sent out on MIDI Channel 2. Aux and Foot Switch: Toggles latch. 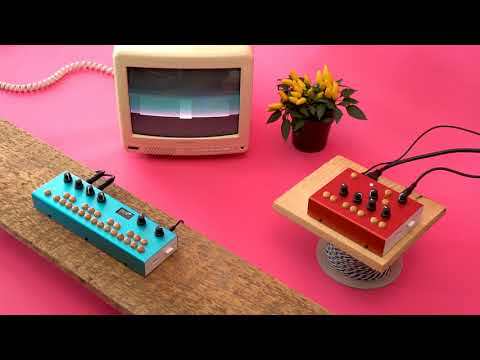 About as simple as it gets: 8-voice synth with four basic waveforms. Aux and Foot Switch: Selects waveform: sine, square, saw, and triangle. Three square wave oscillators combine to increase levels of (dis)harmony. One oscillator produces 'junk'/random frequencies that adds nice surprises. Control three square wave oscillators with this patch. Keyboard controls the base frequency of one oscillator, also tunable with knob 2. The second oscillator plays a selectable harmonic above the base frequency. The third oscillator plays a adjustable amount of random junk frequencies at the beginning of each note. Set the amount of 'Slidiness' as oscillators glide to their next frequency. Aux button controls a sequencer: hold it down to enable recording, begin playing to start a recording, and press Aux again to finish.